This morning the doctors decided to transport Brayden to another hospital that has a better NICU (neonatal intensive care unit). He is now there and the soonest he will be released in Monday (but that isn't likely). For some reason, his lungs stopped developing around 36 weeks (he was born at 39w3d). They came and took him by ambulance on a ventilator which was very, very hard for me to see. He is already showing improvement and we are so thankful for that. Once I get released I will go stay at the hospital with him. For now Chris and my parents are taking turns staying at the hospital I'm at with me (I need a fair amount of help after my c-sec) and going to stay with Brayden. I really want him to be surrounded by people whose voices he can recognize. Here are a few pics - they were taken with Chris' phone so they aren't the best quality. Please keep our baby in your prayers. It is so hard to not be with him. Saying prayers for you and your sweet baby boy. Oh, Jenna....I am so sorry and just heartbroken for you. I can only imagine how hard it must be. Please know that I will be praying for Brayden's little lungs and for you to have a speedy recovery!!! God is still with you and He is in control, even when you feel helpless!!! You and your son are in my thoughts and prayers! I had C-sections with both of my children. The best advise I can give you is as soon as they will let you get up and walk do it, I promise it will speed up your recovery just don't over do it! with my second I got up and walk the next morning and I walk alot that whole day it was much better recovery time than the first!! You will be with your baby soon. I'm praying and I will have everyone I know pray as well. God is bigger than this. I'm so sorry to hear about Brayden's struggles. God is in control..Take care of yourself so you can take care of Brayden later. Praying for all of you. I am praying for you and for Brayden. I agree with the previous commenter and I think I told you this before, getting up and moving will help you heal much faster. Don't overdo it but do as much as you feel possible. I promise it will help. I was released early after my c-section just for this reason. My heart is breaking for you. I can not imagine how you long to hold that beautiful little boy. Know you are in my prayers, on my mind and in my heart. This hard time will be a distant memory as soon as you hold that precious by and take him home. I'm so sorry to hear this about Brayden. H will be in my prayers. It breaks my heart to read this Jenna but I have hope. We will all pray for your sweet Brayden as well as yourself. He is beautiful and I know in my heart he will improve :)! I'm so sorry about Brayden's lungs and so sorry that you can't be with him. I'm praying for ya'll. I saw your dad in the parking lot at WC. I think Brayden had just gotten there. I know this time is rough but I know he will be okay! I'm so sorry you are having to go through this! I cannot imagine how hard it must be to be separated from him. I know he is getting the very best care! Thinking about you and praying for you, Brayden and Chris! I am praying for Brayden's lungs to develop, develop, develop! Also will be praying for you until you get to be with your baby. God will comfort you until you can heal and be with him! Oh Jenna....I am praying for Brayden! And I am praying for you and Chris too. May God bless those little lungs!!! That is so strange they stopped developing like that at 36 weeks, will they be able to find out why? 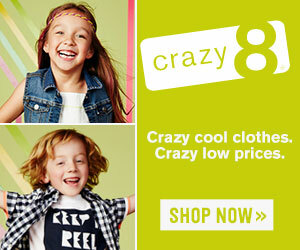 I found you through Kelly's site and have been following you for a while. I am in constant prayer for you and Brayden. I can't imagine how you feel right now. God is with you and Brayden and I know you have tons of people out there praying. You rest and try to relax. God will do the rest! Praying for your sweet baby. Oh Jenna! I'm sorry! He looks really good, though. I am so glad you are keeping us updated. You are in so many prayers. Jenna, you guys are in my thoughts and prayers!! I can't express how truly broken hearted I am for you right now but I know that God is good and he will help little Brayden make a speedy recovery! It just breaks my heart that you can not be with Brayden. I do not have any idea what you are going through, but I know God is the Great Physician, and Brayden is in His hands. Here via Kelly's blog... just wanted to tell you that I'm praying for Brayden too. Sorry that you aren't there with him. Wishing you a speedy recovery from the c-section, so you can go and be with your lil guy soon. Praying for you and your sweet family. Before long your sweet baby will be home! OH Jenna! Be strong for Bray! I know things will get better...God heals! oh Jenna... I am praying for braydens lung development, for your healing and for your families travels back and forth. God will take good care of you all. I hate that you are having to go through all this! I am a Catholic school teacher in NY and I will have my classes praying for baby Brayden. All of God's blessings to you and your family. I read about you on Kelly's blog. I just wanted to say that I am praying for you and Brayden. My husband and I went through a similiar situation back in January when our daughter was born with under-developed lungs and pneumothorax (a collapsed lung. 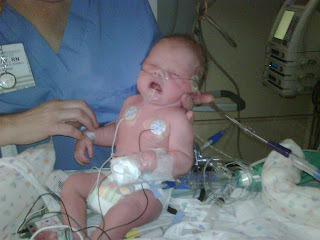 I also had a c-section and baby Grace was airlifted to ACH in Little Rock. We live in Mena, so our whole family pretty much spent a week three hours away in LR. She was released two weeks later. I know how if feels to not be able to be with him. I pray that you will have peace and strength and a quick, smooth recovery and that sweet Brayden's lungs will heal perfectly and quickly too! I'm praying Jenna, for your family. Sara and sons from Italy. I am so sorry that you and your family and your new sweet little one are having to go through this. I'm praying for y'all now, and I'm going to keep praying as often as I think of y'all. Take care of yourself! I am praying for you and Brayden! Please keep us updated! I am praying for you, your hubby, and sweet lil Brayden. I can't imagine what you are going through and feeling. But please know you can count on my prayers. He is a real cutie. Praying for you and your little Brayden. He is absolutely beautiful. I am Mary Avery Wigley's mother and read about your birth experience on Kelly's blog. No one can really understand how it feels to have your baby taken by ambulance on a vent unless they have been throuogh it - I have. It is a scary and empty feeling. It is not the way things are supposed to happen. I just wanted to let you know that I know what you are going through and will keep you, Chris and Brayden in my prayers. Someone mentioned that God is the Great Physician, and he certainly is. But we are so blessed that God has let our medical technology advance to the point that ill and preemie babies can be so well provided for. You have a beautiful baby boy and I just know that God will continue to heal his little lungs!!! As you heal from your c-section, he is also healing, just away from you right now. You WILL bond with him later! And I hope and pray that later is sooner. I will be keeping up with you and Brayden on Kelly's blog and look forward to his homecoming soon! I'm praying for you & Brayden. He's a cute one! I am praying so hard for both of you. Please keep us updated! Praying for sweet little Brayden and you! I know he will be a trouper and you are too! I am praying for you all! SK had some breathing issues when she was born and I have never been that scared before. I know he is getting great care there. HE IS A PRETTY BABY..GOOD LUCK HON, HOPE HE GETS TO COME HOME SOON AND YOU HEAL QUICKLY. Oh Jenna, I am just catching up! We are praying hard for sweet Brayden! I am praying specifically for you too... for your heart and that you don't worry too much... and for you physically that your recovery goes well so you can go be with your baby!!! He is so so beautiful! Congratulations!!! Jenna, you have been on my mind and my heart today. Our prayers are with you, your husband and with Brayden. Remember God said "When you pass through the waters, I WILL be with you; and when you pass through the rivers, they WILL NOT sweep over you. For I AM the Lord, your (personal) God, the Holy One Of Israel, your Savior." God knows your need. We are lifting you up to Him tonight! Oh Jenna my heart goes out to you. I know this is so hard for you and Chris. Know that I am praying for you. Keeping you and Brayden in my prayers! My Brayden & I will definitely be praying for your little one. Praying for you and your adorable son. I just know that everything is going to be okay. He is precious. Thinking of you. Hi Jenna - I have followed your blog for a little while now but have never commented. I am so sorry you can't be with your baby boy the way you want to be right now. I agree with previous posters about walking as soon and as much as possible to help speed up the healing process from your c-section. I know you are so worried about Brayden in a way that only mothers can be. Try and take care of yourself so you can take care of him. I hope you have a speedy recovery and are reunited with your sweet baby boy soon! I am praying for you, Chris and Brayden! I have been keeping up with your blog and congrats on Brayden. Just wanted to let you know the same thing happened to me and my son. 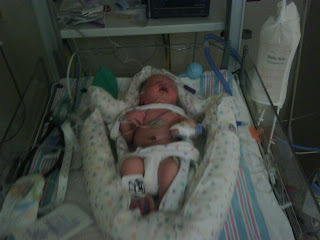 I had him at 38 weeks and his lungs wern't fully developed either. Some reason they say that white males are slower developing than others. Will got of the hosp. 5 days later, I know what you are going through. I will lift you and your family up in prayer. May God speed your healing and Braydens. Jenna, He is beautiful and we are praying for Brayden, you and the medical staff. I can not imagine how tough your recovery must be while you are away from your sweet boy. Just know that God is in control and that your family and Brayden are surronded by prayers and love. He is so perfect and his lungs will be perfect very soon. Get your rest while you can and know that those lungs will be screaming for you very soon. Sending you thoughts and prayers from NYC. I will keep Brayden in my prayers, he is so precious! I check your blog daily and I have a 10 month old baby girl. My heart goes out to you and your husband, you will get through this and very soon he will be home, resting in your arms. I have thought about your family so much!!! Please know that he is in our prayers! Hi Jenna. I've bee reading your blog for a few months now, but have never commented. I just wanted to let you know how sorry I am that you are having to go through this. I will be praying for Brayden. Just checking in... and wanted to let you know we're praying! Praying for you, Chris, and Brayden - I hope his lungs are growing strong so he can come home with you soon. Praying for you and brady bear. I am praying you, your husband and sweet Brayden. I have been in the same spot with one of my grandsons and my heart goes out to you. Just keep your eyes on Jesus!